Component Developer Magazine (CoDe) is a bi-monthly publication for IT managers and developers focused on Microsoft technologies and developer tools, such as Visual Studio, .NET, etc. >> Read the magazine online here. 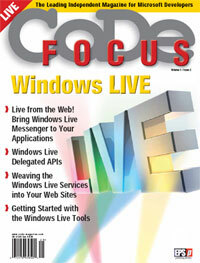 >> Download CoDe Magazine - Windows Live Edition (PDF). >> UPDATE: The article Live from the Web! Bring the Windows Live Messenger Experience to Your Web Applications is now also available online here. Chances are low any of you has noticed, but yesterday Microsoft blocked messages that included links to either sohu.com or qq.com. Coincidentally, these domains are owned by two of Microsoft's biggest competitors on the Chinese online market, respectively a search engine/portal and an extremely popular instant messaging client. According to Sohu IT, the "...could not be delivered to all recipients" error message started to appear around 2:00 PM for every link to any page on these domains. Around 2:47 PM the filter on sohu.com was lifted, but Tencent's qq.com domain remained blocked for a little longer. At the time of writing, both domains are allowed through again. 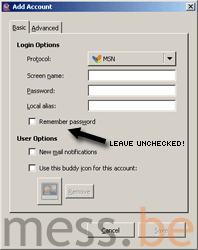 Asked for an explanation for the temporary ban, an MSN China representative said there has been no change in the MSN/Windows Live Messenger client, nor was the company deliberately censoring communication about these domains. An unfortunate glitch must've blacklisted the rival domains, temporarily adding them to the absurd list of banned URLs. Pidgin, the multi-protocol instant messaging client that allows you to use just about every IM service at once, has been updated to v2.4.1. Interesting for those using Pidgin with their Windows Live ID is the fix in this version which makes the contact list now omit non-Messenger (i.e. mail-only) contacts. A word of warning regarding Pidgin though. It's a little known fact that the software deliberately stores passwords in a plain text file (take a look at the accounts.xml file). A blog post last month (and this is no April Fool) about someone being extorted by a Russian hacker in order to regain access to his Gmail account, proves that this insecure way of storing usernames and passwords is actively being exploited via hacks and trojans. Whatever you do -and this recommendation also counts for many other applications including Windows Live Messenger- do not check the "Remember password" option! Meizu, makers of the notorious iPhone clone (or "iClone") M8, have announced that they're adding a free mobile version of Windows Live Messenger to their cellphone when it ships. The nonofficial client will connect to the network via Wi-Fi. According to this forum post which has all the details on the M8, it will be released sometime in the first half of 2008... if Apple won't start slapping them around with lawsuits that is. >> Windows Live Messenger compatible clients for the real iPhone: Apollo IM, Mundu IM, Heysan & JiveTalk, eBuddy, Meebo.